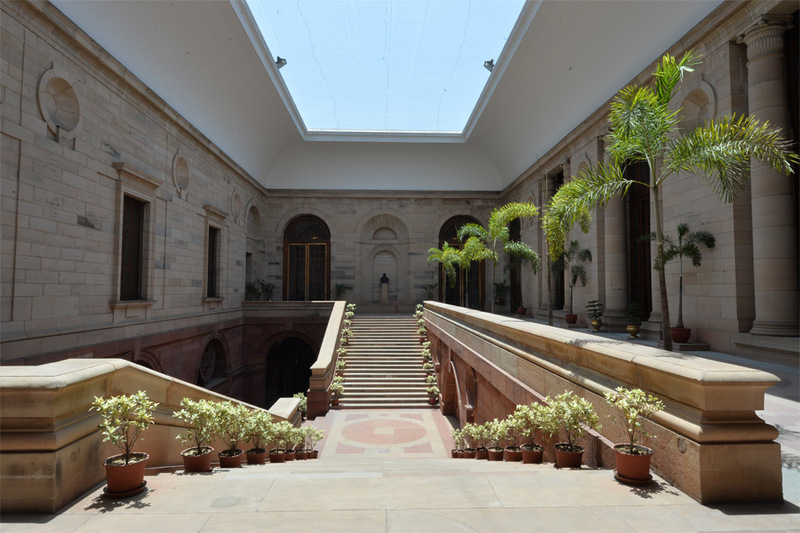 The approach to the Banquet Hall is through Lutyens’ Grand Stairs. Made in sandstone and grand in scale, measuring 111 feet in length and 53 feet in its width, these stairs lead to the Banquet Hall at one end and to the Ashok Hall on the other. While one gets an impression of being indoors at the time of crossing these stairs, in reality these are completely open from above and afford a clear view of the sky and the Central Dome of Rashtrapati Bhavan. It is said that this space provides the closest view of the Dome in the entire building. 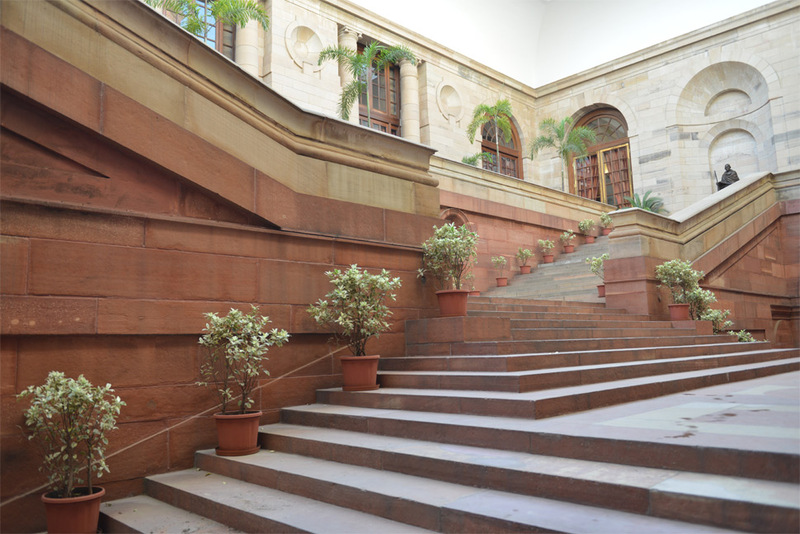 Lutyens’ Grand stairs have been described as “one of the most memorable spaces in the whole building” due to their architectural detail and magnificence. In an alcove at the top of the staircase is placed a bust of Sir Edwin Lutyens, under which is engraved in stone, “Architect of this house.” This bust was sculpted by H.A.N. Medd in England on the request of Lord Mountbatten. At the opposite end, a bronze statue of Mahatama Gandhi stands tall. Made by Ram V. Sutar, this is the only sculptural representation of Mahatma Gandhi at the Rashtrapati Bhavan. It was installed on July 25, 2013. The statue is graced with Bapu’s wise words, “In the midst of untruth, truth persists – Mahatma Gandhi”. During banquets and other diplomatic functions, the President’s Bodyguard, in their ceremonial best, line up along these staircases adding grandeur to the entire ceremony.